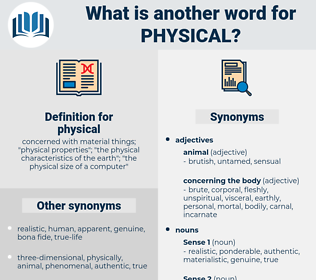 What is another word for physical? 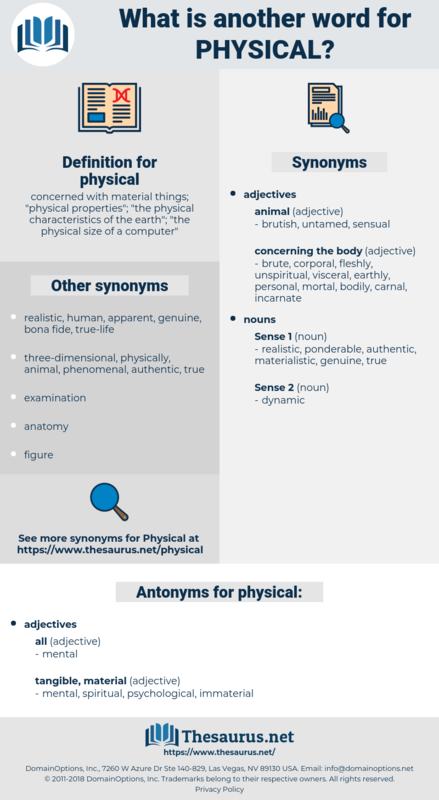 concerned with material things; " physical properties"; " the physical characteristics of the earth"; " the physical size of a computer"
materialistic, somatic, in-kind, manual, biological, physicochemical, physical-chemical, clerical, factual, physiotherapy, physiologic, individual, physico-chemical, financial, psychic, logistical. athletes, implements, objects, harbours, products, items, physiotherapy. factors, Adults, Associations, Classes, Bodies, levels, barriers, periods, modes, Programs, looks. insensible, disembodied, imperceptible, lethargic, airy, bodiless, supernatural, unforceful, thin, unreal, Gossamery, impalpable, invisible, diaphanous, unnoticeable, Discarnate, tenuous, forceless, ethereal, Hyperphysical, vaporous, formless. Death is the triumph of the physical.